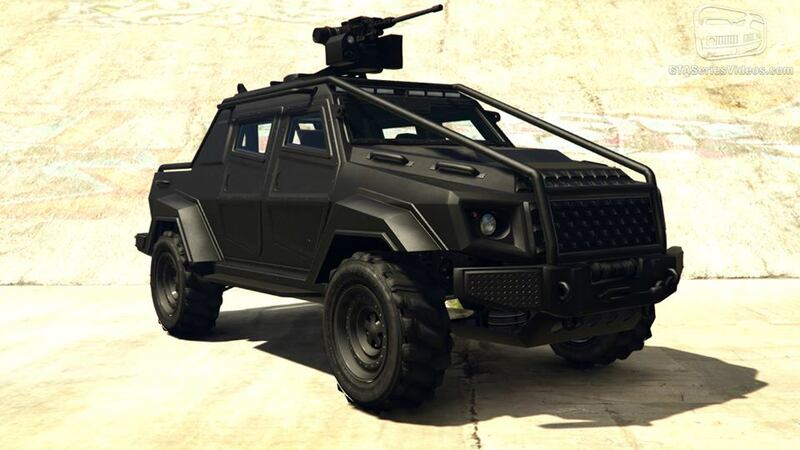 The HVY Insurgent is an Off-Road vehicle featured in GTA Online as a part of the Heists Update. 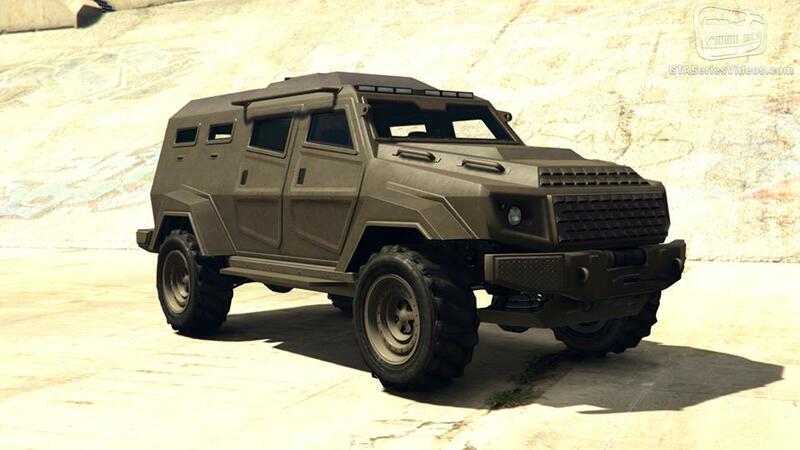 The Insurgent is a large armored vehicle that appears in many forms and variants. The vehicle itself is mainly based on the GURKHA armored vehicles, characterized by the roof-rails, hood details, rounded headlights, roof hatch and front bumper, with some influences from the Conquest KnightXV, especially the single-door rear entrance and a small grille over the main one, where the hood is slightly pronunced. It is also based, to a lesser extent, on the Marauder, apparently for the raised suspension, the semi-squared door windows and a similar tail lights scheme, except that the ones found on this vehicle are squared. Depending of the variants, the armed, open-bed one takes more resemblance from the GURKHA, while the unarmed, closed bed one from the Conquest Knight. It seems to come in a black/dark blue paint scheme. The HVY Insurgent features multiple accessories, including a front roll cage, roof-mounted lights, SUV-like compartment and a roof-mounted machine gun. It is seen carrying passengers on the sides, as there are roof-rails over it, as well as the capability of carry 2 passengers on the truck bed. It’s also referred as LAPV, which stands for Light Armored Personnel Vehicle. The HVY Insurgent is highly durable, on par with the Rhino, if not more. Both Insurgents can survive around three tank shots, around 6 Buzzard rockets, five RPG shots, or seven Sticky Bombs. It can also ram parked aircraft, blow them up (depending on speed), and continue to drive without any noticeable damage. 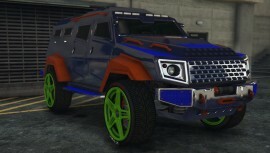 The vehicle has bulletproof tires by default after purchase, and since it is already fully armored, it never deforms, no matter how hard it hits an object. 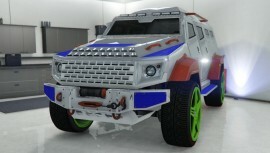 The Insurgent can hit vehicles its size or smaller at high speed without losing much speed, and can hit other vehicles with such force that they might flip over. The Insurgent has above average speed and acceleration for a vehicle its size, achieving nearly 100+ mph, and with decent traction to boot. Overall, the HVY Insurgent is a massive force to be reckoned with, with high explosive durability, acceptable performance, and is well suited to a role as a battering ram. 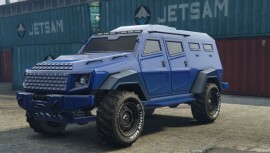 The Insurgent SUV can be purchased on Warstock Cache & Carry for $675,000 after completing the Humane Labs Raid Heist Finale. The Insurgent Pickup can be purchased on Warstock Cache & Carry for $1,350,000 after completing the Humane Labs Raid Heist Finale.